Last year I added white paper lanterns as ornaments to my Christmas tree. They looked gorgeous because they glowed from within. I was able to attach the tree light up inside the lantern. They were the prettiest thing I have ever put on my tree! This year my tree will be decorated with white glowing paper lanterns again… but with a twist. I’m frosting them so theses ornaments glow from within and sparkle on the outside! A big thank you to Diane at AN EXTRAORDINARY DAY, Mary Beth at CUPCAKES AND CRINOLINE, Malia at YESTERDAY ON TUESDAY and Stephanie at THE SILLY PEARL for all their hard work putting this great, creative linky party together and inviting me to join in! 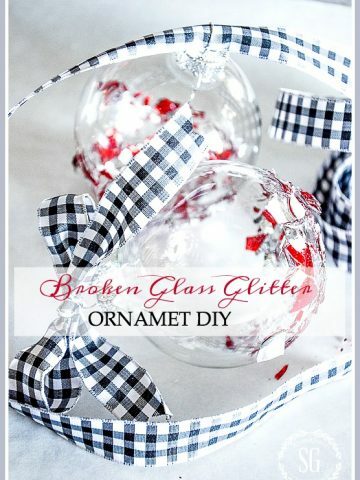 It’s not too early to start some fun, Christmas diy’s! 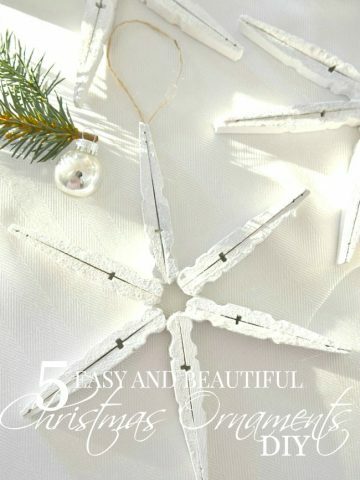 If you are looking for the most easy, simple, anyone-can-do-this, breathtaking Christmas ornament… you have found it! 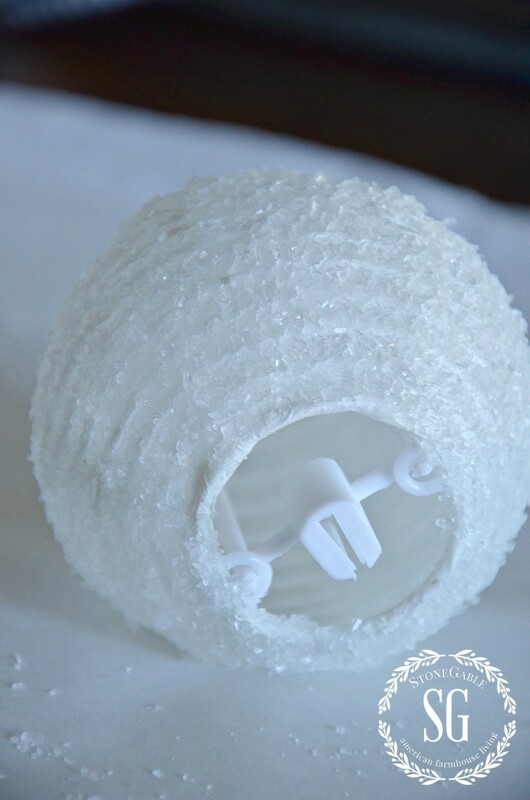 Creating these snowball inspired ornaments takes only minutes… and when they are on a tree… oh my! They glow and sparkle and are so unique! The camera really does not do these ornaments justice. 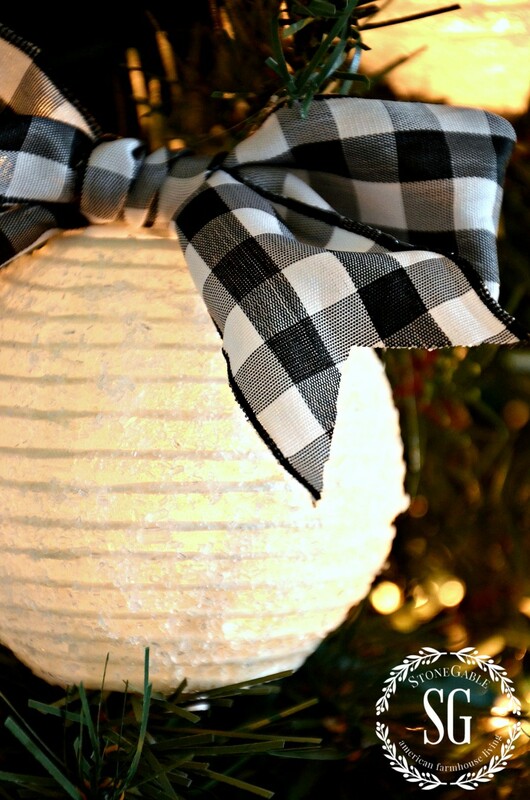 Materials: paper lantern, assorted size, Epson salts, glue or Mod Podge, old paint brush. I got my paper lanterns from Wholesale Paper Lanterns. They are very inexpensive!! I used the 3 inch lanterns in this post. 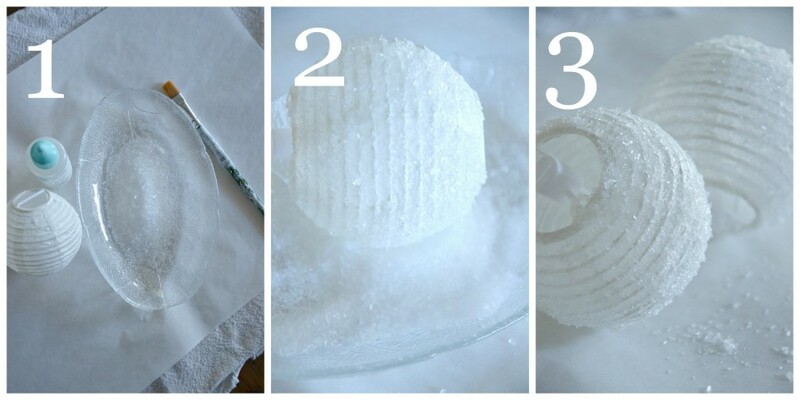 Brush glue on to the paper lantern and roll in Epson Salts. Cover the entire lantern. *NOTE: The lanterns can now be ordered (they were out of stock). They are back ordered, but the company will be getting them in next week. 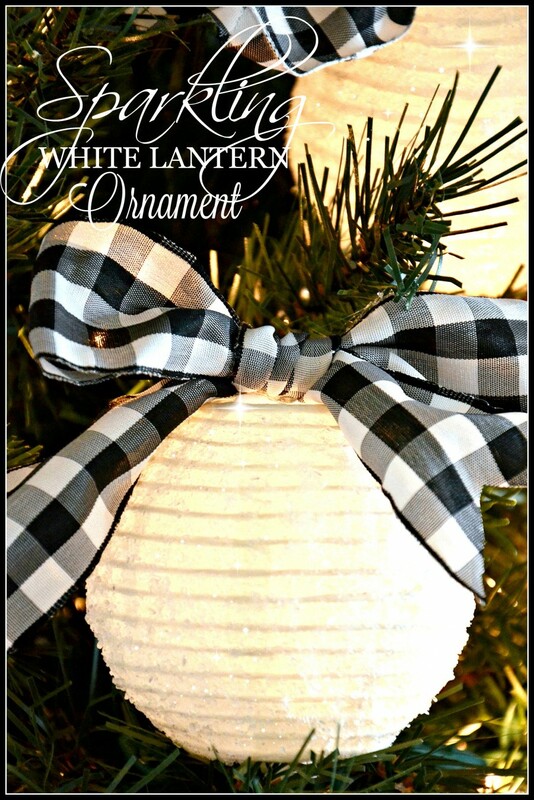 Hot glue your bow of choice to the top of the lantern. 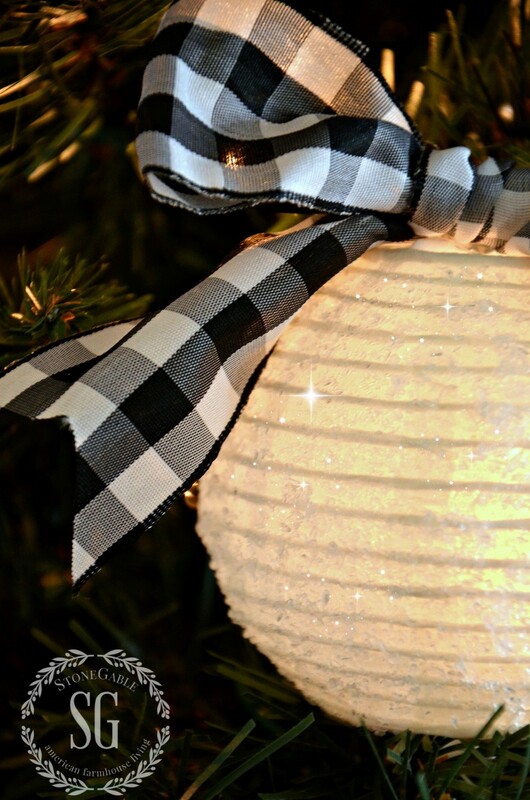 I’m using black and white check again this Christmas! I adore black and white for Christmas! Fix the ornament to the tree by slipping the wire next to a light into the fitted socket at the bottom of the lantern. PLEASE USE ONLY THOSE SMALL TWINKLE LIGHTS THAT DO NOT GET HOT. ANY OTHER LIGHTS MAY NOT BE SAFE. Then push the little light up into the paper lantern. I’m making a tree full! Are you joining in? You can follow me on Pinterest and see what I’m pinning every day HERE! 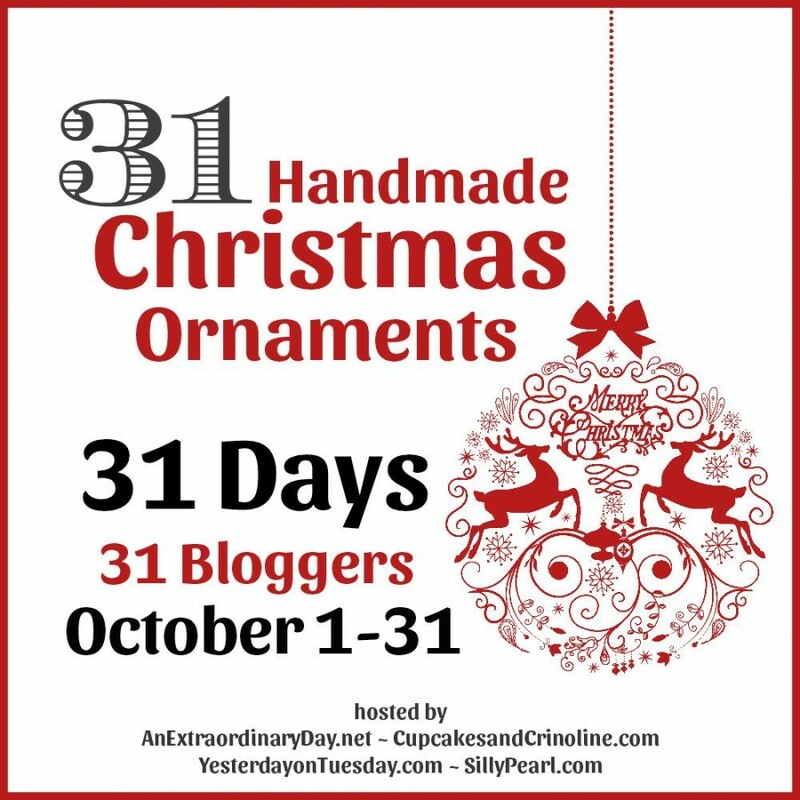 I hope you will enjoy visiting all the creative ornaments! Hello! I can’t wait to try this idea but when I clicked you link to buy them it took me to justartyfacts.com. Not whole sale paper lanters. I’m not sure if these have to slot to hook the mini light into. Is the link correct or is there a specific name of lanterns I can google? Thanks! I can’t wait to get these and start! These are so cute that I purchased 20 white and 10 red for Christmas this year. But they won’t fit onto my pre-lit tree. There isn’t enough slack in the wiring to get them latched onto the wire. I think I’ll pile them in a bowl or glass vase but thought others might want to know there might be problems with a pre-lit tree. Or, if someone knows how to make it work I’d love to hear how you did it. I love these little lanterns but I have a question. Are these placed on the lights of a pre-lit tree? I saw the slip on the bottom of the ornament and just wondered if it is safe to put these on that type of light. Thank you, I love this pretty idea! 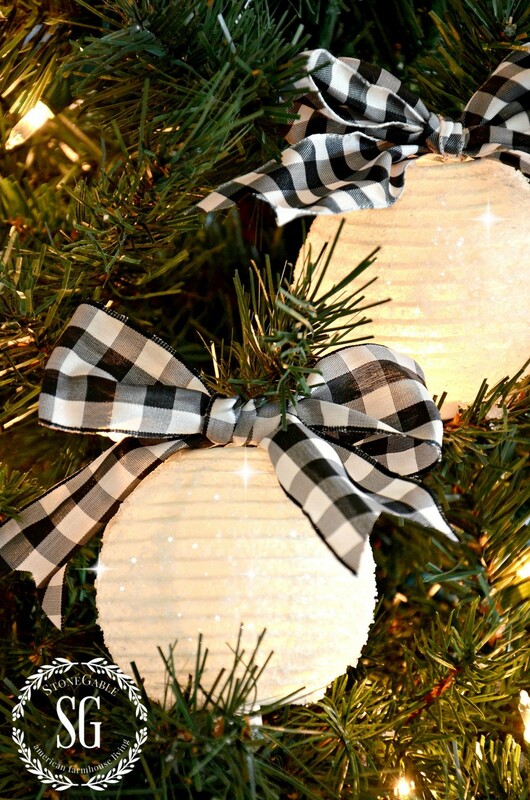 Hi Louise, These little lanterns clip onto the lights on the tree. Hope this helps. Wi so love these little lanterns, they are just too cute. Thank you so much for the how too’s . These look so fun but I wish you had included a picture of the entire tree. It would great to see how many you used per tree – the big picture so to speak. Thanks. BRILLIANT! What a fabulous and inexpensive idea. Love it! I found you on the linky party palooza and so glad I did. 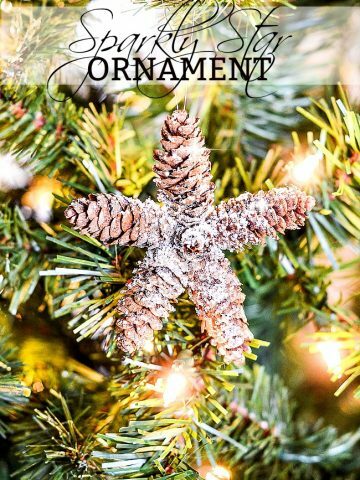 Your ornament ideas are awesome. I am so excited to be following along now! Kara, welcome to the StoneGable family! These are beautiful! LOVE that you used epson salts – genius!! Can’t wait to see your tree! Gorgeous!! I just ordered a set of 10. I’ve got two toddlers and I’m stressing over how to setup my tree without disaster, I think these will be great! These are so beautiful – pinned! ABSOLUTELY ADORABLE!!!! Love how this looks. A great idea… I need to see if I can find some laps around here! I LOVE these! I definitely want a whole tree full! Maybe two! Beautiful idea!!! Love it! Hope you’re having a great week. SO pretty, and Epsom salts – who would have thought?! I love the black and white bow too, a clever way to make them seem so modern. I just was thinking where is the place you get your pillow covers at? I was in Home Goods,,Oh,,already bringing out Christmas ,and I saw some pillows but so pricey!! Lots of old fashion things this year!! Yes, I am joining in, I love it! Just lovely, Yvonne. I just ordered some and I have a feeling I’ll be ordering more next year! Thank you……. Can’t wait to make these ! Thanks for the update, Karin! I would love to see a picture of the whole tree. Great idea…. These ornaments look so beautiful! I bet your tree is going to look lovely this year. Gorgeous! Gorgeous! Yvonne! I love this. I remember how beautiful your black and white was last year. Do you do anything special to attach them to your tree? Thanks! Now I am excited! They are attached at the bottom. See the bottom of the lantern. Just curious – why did you use epsom salts instead of glitter. I’ve never done any crafting with epsom salts. Hi Laura, the epson salt looks like icy snow. And it is so inexpensive. Give it a try! Oh my…these are spectacular! Just when I thought there was nothing new for me to do for our Christmas decor…thank you Yvonne! Thanks so very much for including me, Diane! Love this idea! Just ordered some and can’t wait to make! Thanks for your darling idea. Yvonne, these are AWESOME!!! Can’t wait to try it! Yvonne, everything you do is gorgeous, including this! Pinning! Just darling Yvonne! How many do use on your tree? LOTS! I don’t have an exact number for you! Adorable! I love how sparkly they are and those black and white check bows. I now want an entire tree like this – so clever and beautiful. Happy Wednesday, Yvonne! Love it! Just ordered the lanterns! I have several trees. This will certainly spruce up the older ones! Thanks! Where did you find them? The Wholesale place is on back order. I think these would be lovely strung across my mantle with some tall candles and greenery. Just curious – why did you use Epsom salts as opposed to glitter? That sound so pretty Laura! These ornaments are beautiful! I love the ribbon you chose. Thank you for sharing. Omgosh Yvonne this is too cute what a great idea and I love sparkles too. Think of all the ribbon options to use. Not to mention how good this would look with my glitter houses. Are these ornaments safe to use as the ornament is paper and the lights get hot? I’ve had no problem. Use the twinkle lights as they do not get hot. I love this idea! Can you show us a picture of the entire tree? I will on one of my Christmas tours coming up in early December! What a beautiful way to decorate a tree! I love how you frosted these and how they are lit from within. The bow on top is the perfect finishing touch. What an adorable idea, Yvonne! 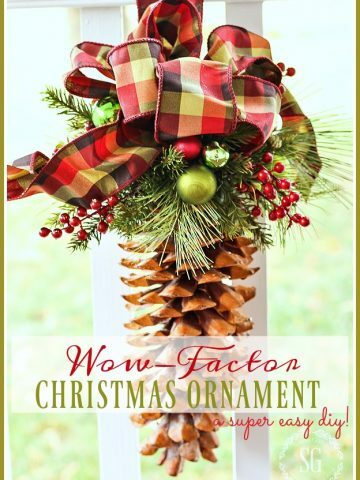 Will you be having a Christmas home tour? I would love to see the tree in its entirety! Hi Nancie, I’ll have all kinds of Christmas tours!!! Love this! The black and white makes it so gorgeous and classy looking. Just like you. Yvonne!! I love this idea and there’s plenty of time to get busy and make a dozen or two. Love, love, love these for my black and white themed decorations! I’m ordering today and getting started on this. You’ll never know how much I enjoy your blog! DARLING!!! What a great idea, Yvonne! I love that idea!! Since we leave the day after Christmas for several months we don’t do a whole lot of Christmas decorating. But these lanterns are adorable. I think I could leave these up and enjoy them in the evening once we get back. I love how the house looks when it is decorated and I really miss that.